Desire is the spur for more than one kind of creation. 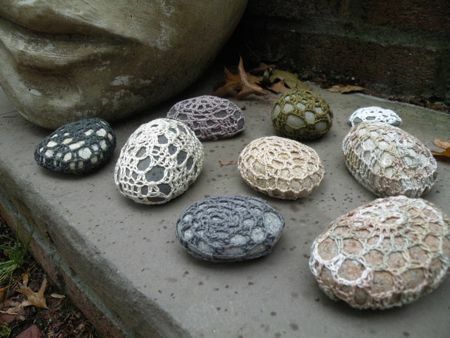 In July I saw photographs of Margaret Oomen’s little urchins: crochet covered sea stones. I wanted them. Alas, her Etsy store was sold out. So, I have been conducting a side project this summer. Based on instructions published by Oomen in the purl bee, I’ve been making some of my own, with stones picked on the shores of Cape Cod, Lake Ontario, and South Boston; a 1.40mm steel crochet hook; Valdani embroidery threads; and a darning needle. Voilà! the above stones. What will I do with them? They’re like children — I made them, but I don’t have to cling to them. If I know you, and now you want one, please let me know. I’ll send you a surprise — a little piece of geologic history, and me. Oh Jane, you continue to amaze me with your varied interests and talents. Thanks, mom. Do you want one? 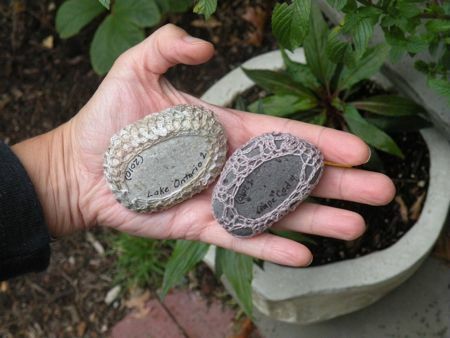 The stone-picking — as well as the crochet — began at your beach, you know. I love all the colors of thread and stone you have used. I adore that you have written the provenance on the bottom. I might just have to borrow that idea when I add some stones to the shop next month. 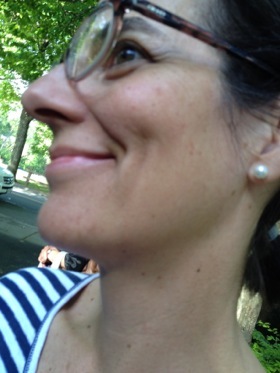 Thank you for writing, Margaret! The instructions, by the way, were excellent — so good, that I sort of figured out the underlying scheme and was able to vary the pattern from stone to stone. And I agree that finishing them off — shaping and closing them around the stone — is the fun part. I was reading about these on the purl bee as well. Your stones turned out beautifully, and I especially like that you marked each one with the location that it came from. I’m feeling a bit inspired right now and may try my luck at making a few. You did a great job.